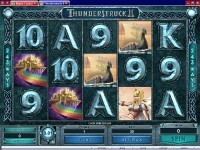 ThunderStruck II is a very feature rich MicroGaming slot that is unique and fun to play. It features 243 ways to win, a wild symbol that doubles your wins, the “WildStorm” feature, and a bonus with four different options for free spins. This slot also rewards you for playing it more with player accomplishments and progression in the Great Hall of Spins. 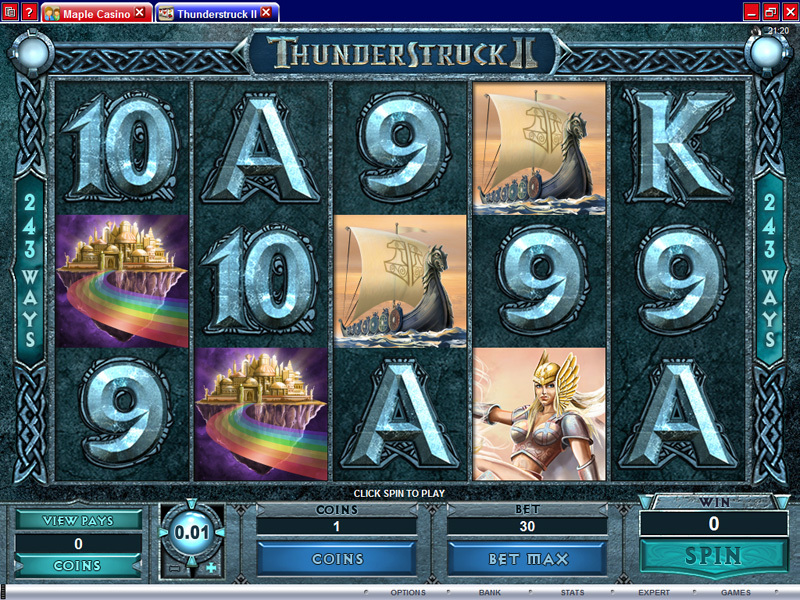 ThunderStruck II is a much better slot than the original ThunderStruck, which is still available to play. 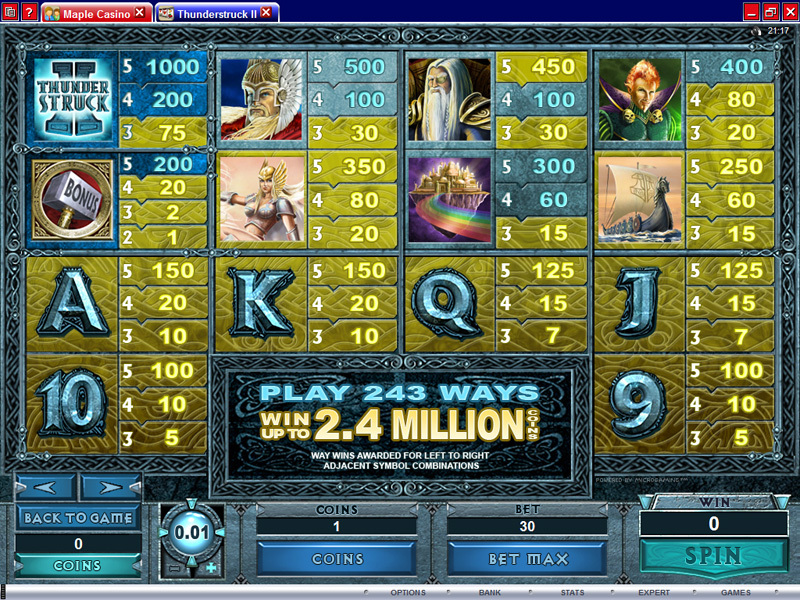 The original slot only had 9 paylines and a regular free spin feature. Much less interesting than this new and improved slot. The WildStorm feature can be triggered randomly at any time, on any sized bet. When you click to spin, the reels all keep spinning longer than usual while clouds form on top, lightning and thunder can be heard, and a Viking warrior drops down onto the screen. After he leaps away, lightning bolts strike the reels making them wild and holding them for one spin. Any number of reels can become wild and some huge wins have been hit when three or more reels are made wild during this feature. 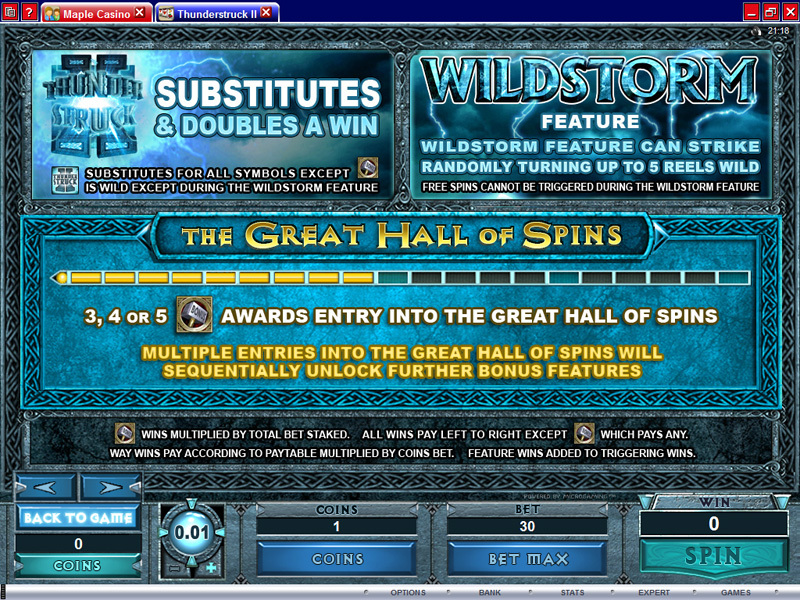 The free spins bonus round is triggered when three or more Thor’s Hammer symbols land on the reels during a spin. The amount of times you have triggered the bonus on this slot, at the same casino, determines the choices you get for free spins. The first four times you trigger free spins, you are only given one choice – Valkyrie – where you are given 10 free spins with a x5 multiplier. The fifth time you trigger the bonus, a new choice is added – Loki – where you have 15 free spins with a “Wild Magic” feature. If the Wild Magic symbol lands on the middle reel during any of those 15 spins, it randomly multiplies itself a number of times to make other symbols on the reels wild. On your 10th bonus trigger, another choice is added – Odin – with 20 free spins and the “Wild Raven” feature. Two ravens randomly land on symbols during those spins, turning them into 2x or 3x multipliers. Finally, on the 15th trigger of the bonus, the last choice is added – Thor – where you get 25 free spins with Rolling Reels and up to a x5 multiplier. On the completion of a winning spin, the symbols involved in the win are removed, the multiplier is increased, and new symbols drop in where there is room created. This can cause multiple consecutive wins from a single spin, and once nothing lines up, the next spin is started. ThunderStruck II also has “Player Achievements”, which allow you to track your progress via the paytable. It shows how far along you are in the Great Hall of Spins, and shows the symbols that you have lined up by turning the paytable information gold for that symbol. It does not count as an achievement if a wild is part of a winning combination. See my TS2 paytable from 32Red Casino in the screenshots below for an example. I have had good times and bad with this slot, so it’s hard to say how I really feel about it. 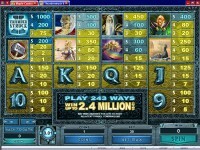 I do like all the features though and it is a fun slot game to play. Play it now at any of these trusted MicroGaming online casinos.